Watson & Co. Chartered Marketing has successfully trained over 1,000 WorldHost delegates to date and we are very proud of our contribution to excellence in customer service locally in Northern Ireland. Back by popular demand we will be running an open WorldHost Principles of Customer Service course in Belfast on 15 April 2019. The WorldHost Principles of Customer Service Training programme helps you and your staff improve the customer service within your business for the benefit of all. The programme teaches invaluable skills and techniques that form the fundamentals of service professionalism, encourages your staff to take pride in what they do and help businesses gain a competitive edge. WorldHost has a proven track record in successfully preparing front line staff to offer the highest levels of customer service and is an essential tool for businesses seeking to protect their bottom line and improve their customer retention rates. It is one of the most effective customer-service training courses available for front-line staff, providing a quality-assured level of service recognition. The delivery of the training is flexible and it can be customised for your organisation and industry. The WorldHost Principles of Customer Service programme is a full day training session that aims to equip your staff with the necessary skills to provide the best service for your customers. You learn from our accredited WorldHost trainer and Chartered Marketer Christine Watson through discussion, role play, DVD and CD case study scenarios and a comprehensive training toolkit. Alternatively, click on the button below to pay via Paypal and reserve your place. 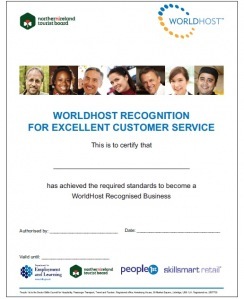 Become a WorldHost Business Recognised for Excellence in Customer Service – once 50% or more of your customer facing staff have successfully completed a WorldHost training programme you can apply free of charge for WorldHost Business Recognition. Chartered Marketer Christine Watson DipM MCIM is a People 1st accredited Customer Service and Digital Marketing Trainer and has a background in mystery shopping and business improvement spanning the past 17 years. She has successfully trained over 1,000 delegates to date.